NOTE: This post remains my most visited, some five-plus years after I first wrote it. There has been some excellent discussion, so if you decide to read on, continue on to the comments for more info on canning bacon jam. I’ve decided to close the comments though, because in addition to lots of visits, this post attracts lots of spam. It takes time to manage that, and some of it is also pretty disturbing. Still, thanks to everyone who has read and has made the excellent comments below. It all began innocently enough. 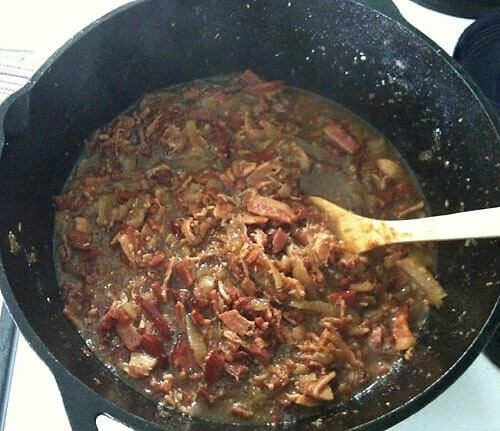 I would make Bacon Jam to take to Bouchercon 2011. A jar would go into my silent auction contribution, and a few other jars would go to friends. The jam would be delivered in cute jelly jars. To add to the fun, I ordered special, custom-cured bacon from a local charcuterie, The Ethical Butcher. The only real hitch was the timing. The fancy-pants bacon was to be delivered on September 9, which means I’d need to make the jam over the weekend so I could can, package, and ship it ahead to St. Louis on Monday. No problem, right? Tight, but plenty doable. Except the magic bacon was delayed, which I learned two days before the planned Bacon Jam production. Le sigh. Fortunately, there are other sources of high-quality bacon. 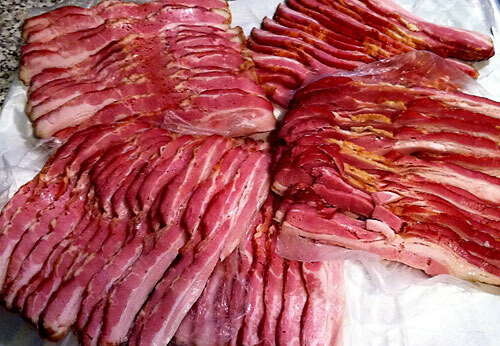 I went to Gartner’s Country Meat Market on Saturday morning, the 10th, and acquired five pounds of their delicious sugar-cured bacon. But then I ran into problem number two: record high temperatures forecast for the weekend. I decided to get up early Sunday and make the jam before the heat. I figured I could be done with canning by early afternoon, then relax on the couch with a beer and the football game. But then I encountered problem number three: I was making a lot more jam than usual. Typically, I work from a pound of bacon, which produces about a cup of jam. This time, I wanted plenty, not only to take to Bouchercon, but also to have for home and to give to family. What I learned on this particular Sunday is even though one pound of bacon can be turned into jam in about 2-1/2 hours, it would be more like 6-1/2 hours to transform five pounds of bacon. It was almost 1:00pm before I was ready to start canning. By then, the outdoor temperature was 92°F, and the temp in the kitchen was at 95°F. Oy! The Bacon Jam itself came out beautifully. The complication came in the canning process. Because it’s a meat product (though with added acid from the cider vinegar), it was necessary to pressure can the jam. No problem, except remember that heat thing? Yeah. But on the plus side, my wife helped prep the jars and troubleshoot the problem of losing the jar rack for the canner. The two of us soldiered on through the heat. 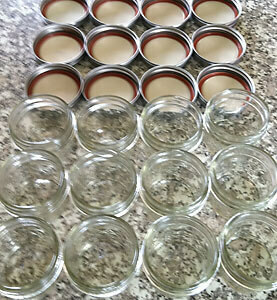 We were able to can six half-pint jars at a time, so the plan was for two batches. Alas, we suffered a containment failure on the first batch. This was sad, because we lost not only six half-pints worth of jam but also we faced with a third round of canning in a kitchen which approached 100°F by late afternoon. 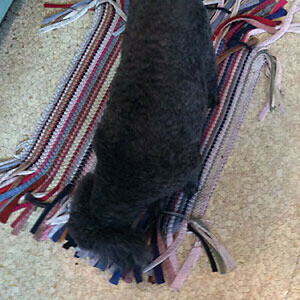 (Of course, we didn’t have to spend the entire time in the kitchen. Once the pressure was up, we could escape to the relative cool of the living room—slightly under 90°F—except for occasionaly dashes into the kitchen for pressure checks.) Each batch from fill to removal from the canner was about 3-1/2 hours (takes a long time for a canner to cool and depressurize in that kind of heat) so it made for a long afternoon and evening. Best as I could tell, the containment failure was due to pressure fluctuation in the first batch. Batch Two was successful (finished about 8pm) and Batch Three came out at 11:30pm. By then, we’d gotten the kitchen temp down to the high 80s. And this morning, I am pleased to report twelve half-pints are cooling on the rack. One of those jars will be opened this morning for a taste test, and the rest will head to St. Louis, assuming the tasting is a success. 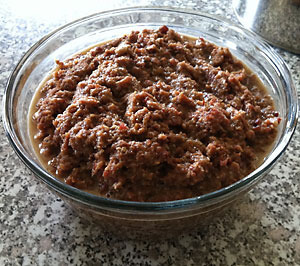 And now, without further nattering, here’s a blow-by-blow of the Bacon Jam creation. My recipe is a variation of several found online. For this batch the ingredients were as follows (divide by 5 for a more manageable recipe, rounding measurements up to the next quarter cup as appropriate). Start with the bacon. Chop it into one-inch chunks and cook until nearly crisp. Drain excess fat and set aside. 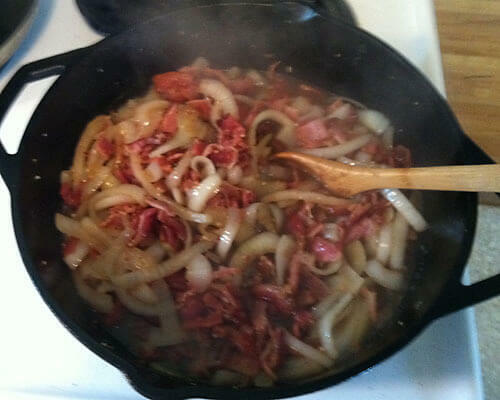 Once the bacon is done, sauté the onions in a little of the reserved bacon fat until they soften, about 6 minutes. Then add the garlic and cook another two minutes or so. 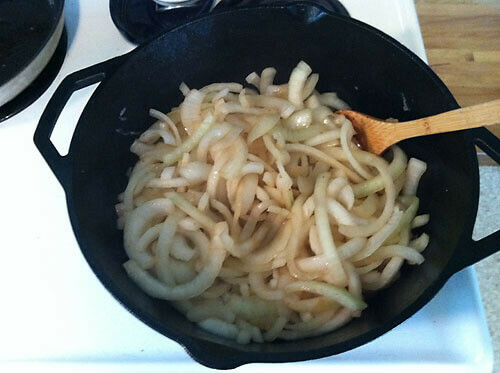 Cooking onions and garlic in bacon fat smells soooo good. 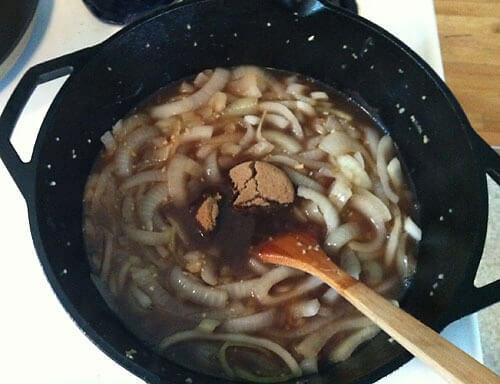 Once the onions and garlic are ready, add the rest of the ingredients and stir. Still smells wonderful. Then add that lucious bacon. Cook for a long time at a simmer. 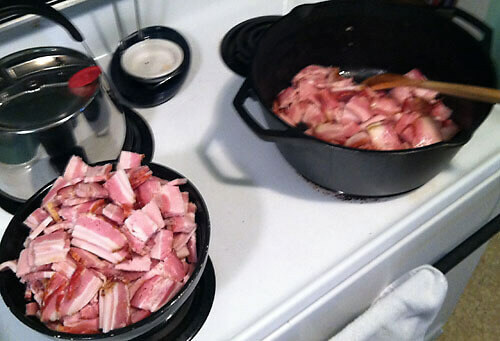 With one pound of bacon, it’s usually about 90 minutes, but for a batch this size, it was closer to three hours. The key is low and slow until the bacon is tender. 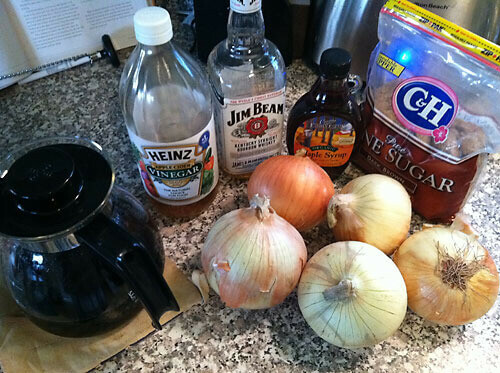 … to prep the jars: wash and sterilize. Once the jam mixture has cooled a bit, pulse it in a food processor with the blade until the bacon is finely chopped but not pureed. You want a nice, spreadable consistency. At this point, you can eat it. It will keep about a month in the fridge, or six months in the freezer. We eat it on crackers, crostinis, or on a fried egg sandwich (on toast or English muffin as you prefer.) Delicious. But, of course, I wanted to transport the jam without benefit of refrigeration. That meant canning. Hello, Pressure Canner of Doom. 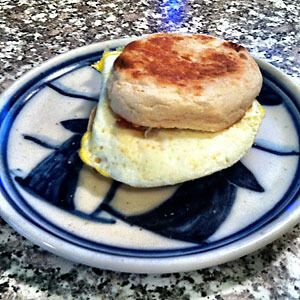 … Taste Test via Lucious Breakfast Sandwich. The Bacon Jam is everything I hoped, and more. It’s soooo good, and so easy. I am also drooling. I am looking for new and interesting jam/jelly recipes to can for gift baskets for Christmas presents and this sounds perfect! I’ve done this a few times now and refined the process a bit along the way. I pressure canned for 75 minutes at 11 lbs. even for the half-pints. My reading on this has made it clear even the small jars need the time. I’m at about 200 feet above sea level. I understand you need to adjust things if your altitude is higher, usually about 1 lb of pressure for every 2,000 feet above sea level. Though definitely double check that. One thing I learned was the original cooking time for the jam can be cut in half when I pressure can it. That additional 75 minutes at 240°F more than makes up for the reduced cooking time. While the fully cooked jam was good when canned, the flavor was richer if I didn’t cook quite as long before canning. The bacon doesn’t get mushy, no. The key is to not overdue in the food processor. You want little bacon bits, not a puree. So long as you’re careful there, you’ll have nice, meaty bits in the jam. I will say I prefer the jam cooked and refrigerated over canned. But, of course, if you want to ship it, you gotta can it to be safe. And really, the difference is one of yummy versus super yummy. Okay, you’ve carried this joke too far. This is the batch which you rejected in St. Louis, by the way. I realize I’m way late to the bacon jam party but THIS POST inspired me to branch out into pressure canning. I have been obsessed with giving bacon jam as Xmas presents and I bought a canner on Black Friday and am set to start the project this weekend. So, thanks for the inspiration. Question, how important is the raspberry vinegar? If its for flavor, can I leave it out? I’d really like to use some siracha sauce to spice it up a bit instead. The vinegar is definitely optional. I’ve done batches with no vinegar, different vinegar, whiskey instead of vinegar. They’re all good. I haven’t used sriracha sauce, but I have done spicy batches with chipotles. Very yummy. I’d think you could definitely get some good results with sriracha. Glad you’ve joined the party! That’s a good point. I’ve always done a sterilization bath by default, but ’tis true it’s a redundant step when pressure canning. Hello, if I cook and refrigerate, (no canning) how long it will last in the refrigerator? It usually doesn’t last long around here, but when I’ve made big batches, I’ve refrigerated it for about a month. It may last longer, but that’s as long as I’ve managed to hold out. made your recipe. it was delicious! was concerned about pressure canning. contacted the 800 number hotline for presto pressure canners. 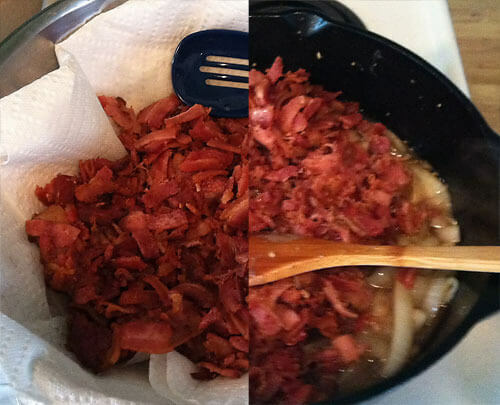 she was emphatic about not pressure canning bacon due to high fat content. due to the high risk of botulism. Thanks for checking in. I’m glad you enjoyed the recipe, and appreciate the heads-up from Presto. I’ve not had any problems with my canned bacon jam, but maybe I just got lucky. In any case, I’m very much in favor of erring on the side of caution so I will take this info to heart going forward. Hi. Been looking for a Bacon Jam recipe – regarding the canning process – do you think I could achieve this by placing the jars in a shallow water bath in an oven at 120*c? This is my normal processing method for jams/chutneys. That sounds like it could work, but I am far from an expert in canning. I’ve encountered a lot of conflicting information, and the more I research, the less certain I’ve become. As you might have seen from the comment by Marti above, the Presto canning folks don’t recommend pressure canning. And yet I’ve also read a number of sources who say that pressure canning is the only way one can safely can meats. I’ve also read one source (http://www.clemson.edu/extension/food_nutrition/canning/tips/21storing_bacon_jam.html) that recommends the only way to store bacon jam is by refrigeration. Most of the time, I refrigerate because I’m only making enough for us. 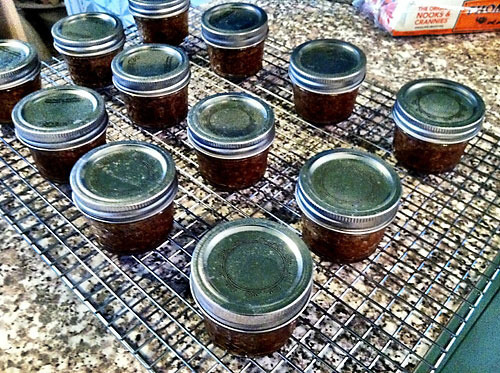 My pressure-canned bacon jam never made any one sick, but that could be because I got lucky. Honestly, at this point, I don’t know what to recommend. In fact, I’ve considered pulling down this post because I worry the information may be incomplete or inaccurate. 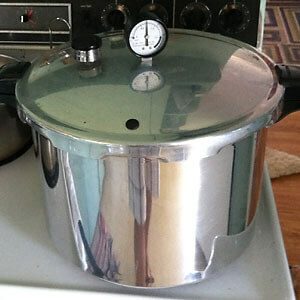 120°C is certainly in the temperature range achieved in stove-top pressure canning, so it may be fine. But I’d hate for you to get sick! Cheers. I sell at Farmers Markets and have been asked a few times if I do Bacon Jam (a competitor does it but I can’t really ask how they preserve it in the jar – if they even use any special measures!). I’m looking for as long a shelf life as possible. Maybe a higher concentration of vinegar may do tge trick and allowing it to mature? May ask my local Environmental Officer for advice. Will let you know the outcome. I love bacon jam and have made it several times. I would like to make a bigger batch and can it for later use and gifts for the upcoming holidays. My question is, how long did you keep your jam stored before using it. Love your recipe. I’m not sure how long the folks to whom I gave jam kept it, but I used my own canned jam fairly soon. It’s been a while since my last canning, but it seems like I used all the jars within three or four months. When I make smaller batches, it rarely lasts a week, but I’ve read it will keep in the fridge for about a month.